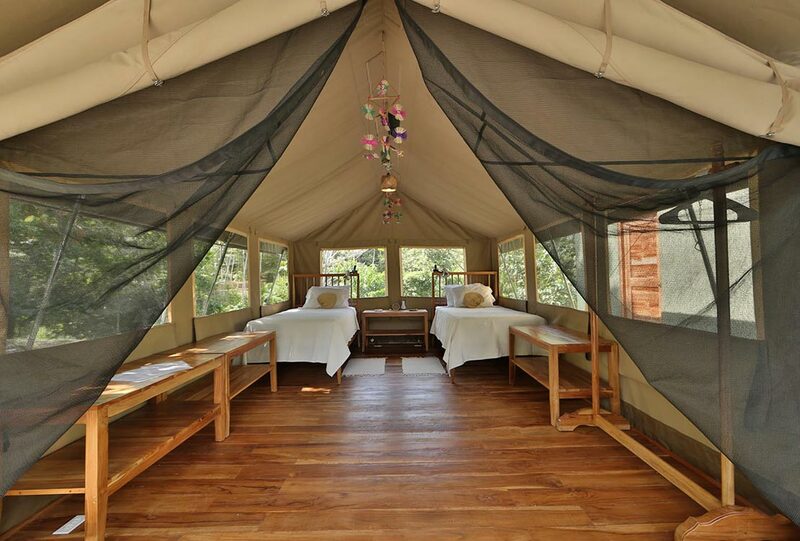 The Canopy Camp has eight African Safari-style tents – the perfect accommodation for sleeping in the jungle! Each tent is raised on its own sturdy platform above the ground, and has a private bathroom just a few steps away from the tent entrance. 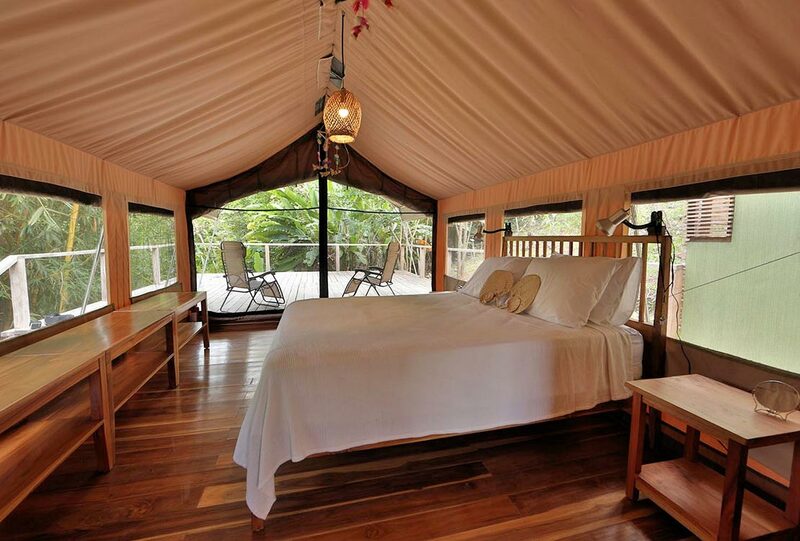 The tents are well-spaced and lush tropical plants and ensure privacy. Each of our spacious standard suite tents at our Panama tent lodge occupies an area of 173 square feet and offer plenty of space to store your luggage, clothing and gear. Large windows on all sides with flaps allow natural light and breeze to enter the tent during the daylight hours. Each has two single beds or one queen bed, two tables, a floor fan and overhead light, and a solid plantation teak wood floor. Our large, two-room deluxe tents offer a bit more space. Each has an area of 249 square feet, including an extra room for a small bed or extra gear. Plenty of windows offer natural light, and can be closed for privacy. Our deluxe tents have two single beds or one queen bed, two tables, a floor fan and overhead light, and a solid teak wood floor. Prices are per person, per package in US$ (+taxes), and include lodging, meals, wine with dinner, internet access on a laptop for guest use, and all tours stated in the itinerary. In the High Season, the Single supplement is $165 per day. In the Green Season, the Single supplement is $50 per day. All rates for all birding vacations are subject to change. If you thought you were too late for your birding vacation, don’t worry. We occasionally offer special deals for bookings made on short notice. Please contact us to see if there are any “Last Minute Deals” on birding vacations at the time of your booking.